I am convinced that many data scientists and data analysts acquire a peculiar reflex. Any time they suspect (consciuosly or subconsiously) that somewhere data is being collected, they develop an irresistable itch to analyze that data, oftentimes not even knowing where the data is! After purchasing my first iPhone, I quickly realized that its Health app is capable of storing lots of data points. 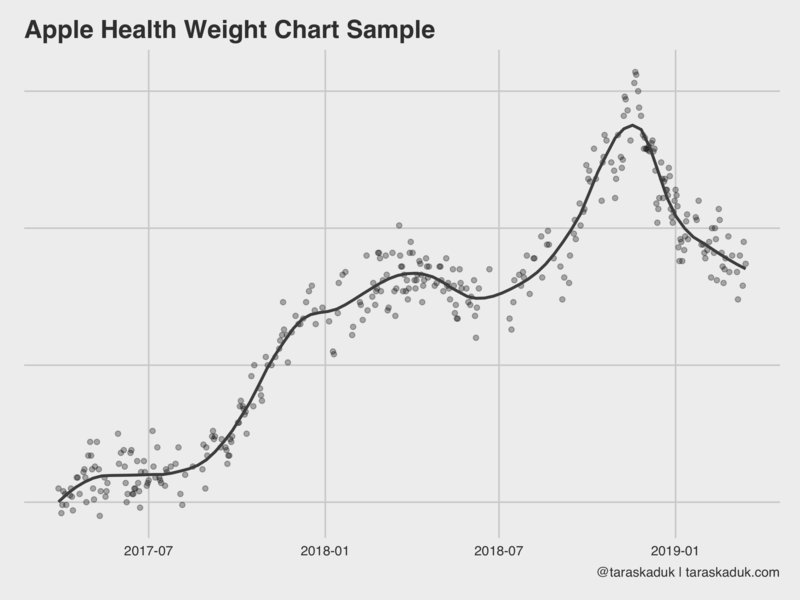 I looked at and analyzed some weight and steps data from my Android phone in the past, but this seemed like a whole new level. I Googled around and found this post from @ryanpraski. The code was reproducible enough, and I ran it on my side, made a few changes and kind of left it. Fast forward about 2 years, I got an Apple Watch, and got a lot more data points into my Health app. 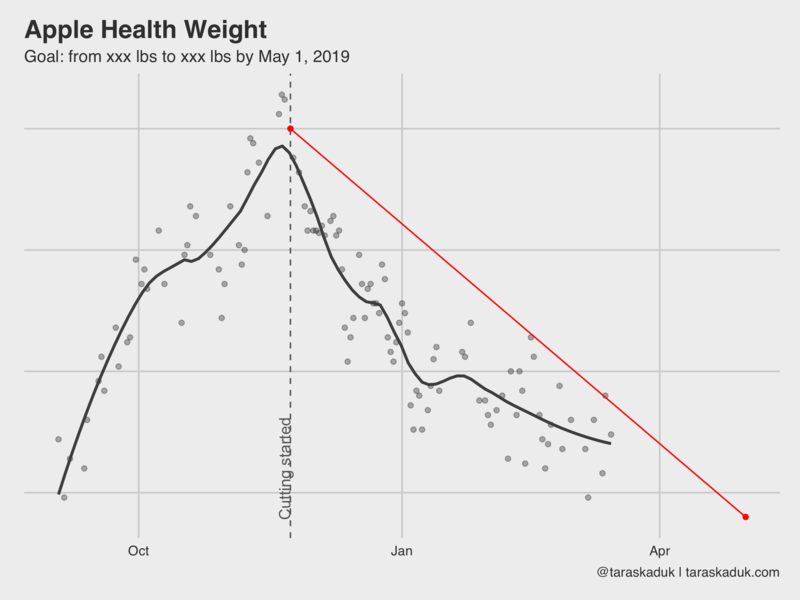 I also got a bit more serious about my workouts and my wellness, and started to rely on Health app data a lot. 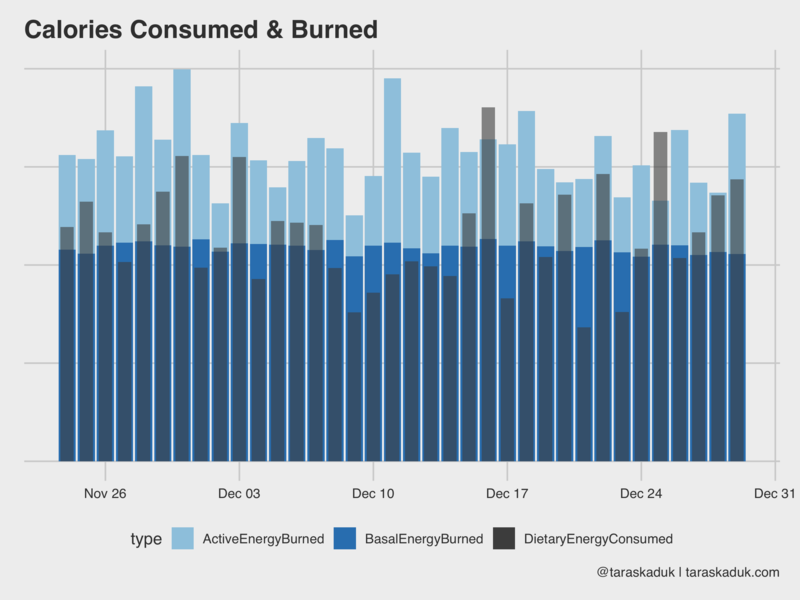 At one point, I even built out a small patchwork dashboard that helped me during my “bulking” and “cutting” phases: I tracked my weight, basal and active energy, calorie intake, daily amount of protein intake etc. 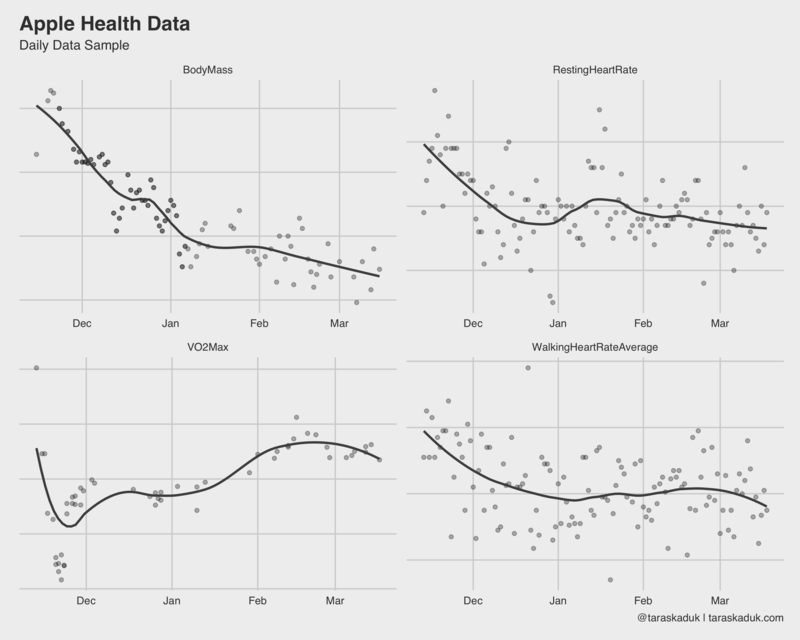 Getting the data out of Health app is pretty easy. From Apple Health, you can export it anywhere. I save it right away into the Files, which instantly appears in my iCloud and is accessible from my Mac. Your mileage may vary based on the path you chose to get the files. You could save it on the cloud, and then access via a web link, for instance. I find the iCloud storage synced up to your Mac being the most convenient solution. Another thing you can do is to use a Shortcut to get the Health data in a different way. For example, there is this shortcut here, but you can write your own. Anyway, back to our zip export. Now that the zip archive is on my Mac, you can break out an R session and start proding. Sys.sleep(3) # pause for 3 seconds to let your computer unzip it. I’m not entirely clear on what export_cda.xml is: it seems to contain the data similar to export.xml, but I haven’t had much luck completely parsing it. I understand CDA stands for Clinical Document Architecture and is a special format to exchange these kinds of data. ExportDate is useful to validate what data are you looking at. $ device               : Factor w/ 140 levels "<<HKDevice: 0x282d440a0>, name:Apple Watch, manufacturer:Apple, model:Watch, hardware:Watch4,1, software:5.1.1>"
$ sourceName      : Factor w/ 1 level "Quest Diagnostics"
Well, this is pretty much it. From here, you can let you imagination run wild. The stuff you’ll be able to do will depend on how much data you store in Apple Health and what’s the use case you have. Below, I’ll just provide a few brief examples of what I did with the data (erasing numeric or other identifying values where necessary). 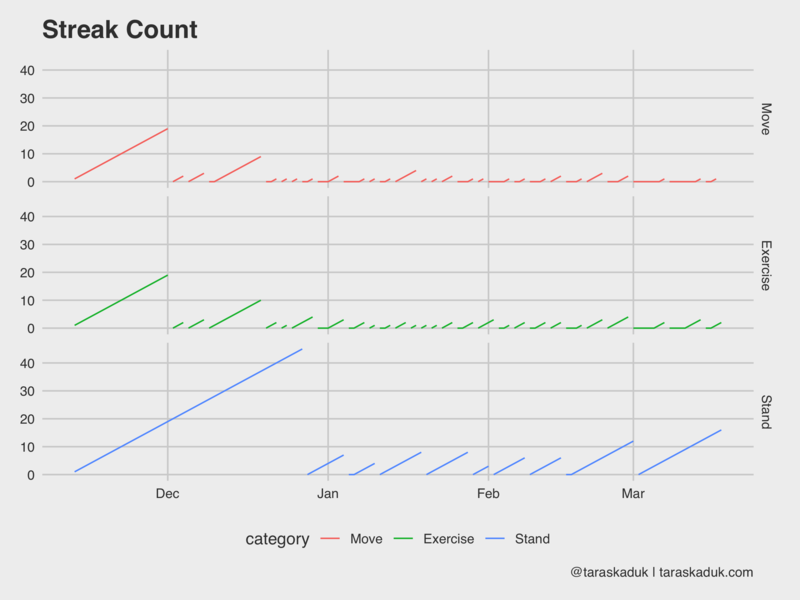 I’ve been tracking my daily weight since my Android times, and tried many approaches. Apple Health + Shortcuts is by far the most efficient and reliable. 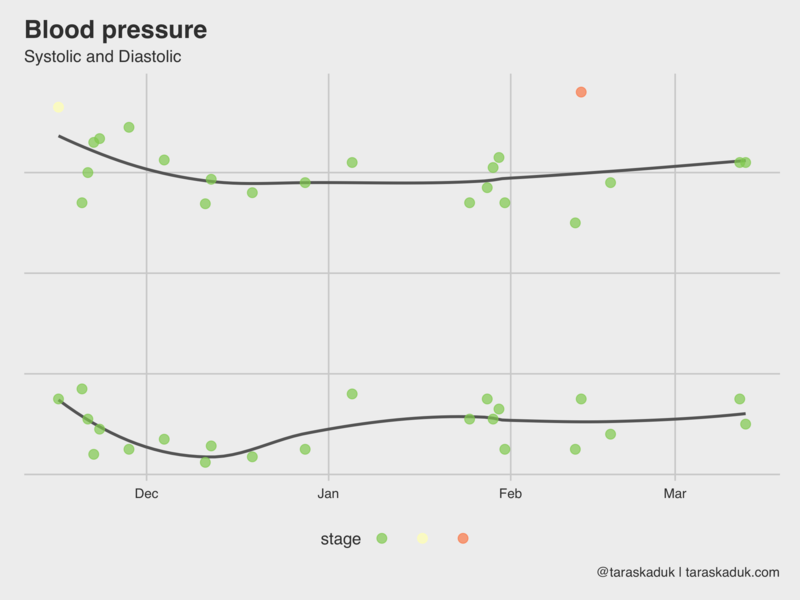 There many more charts you can build from this grain: your resting heart rate, walking heart rate, VO2Max, and anything else that can be summarized to a daily level. 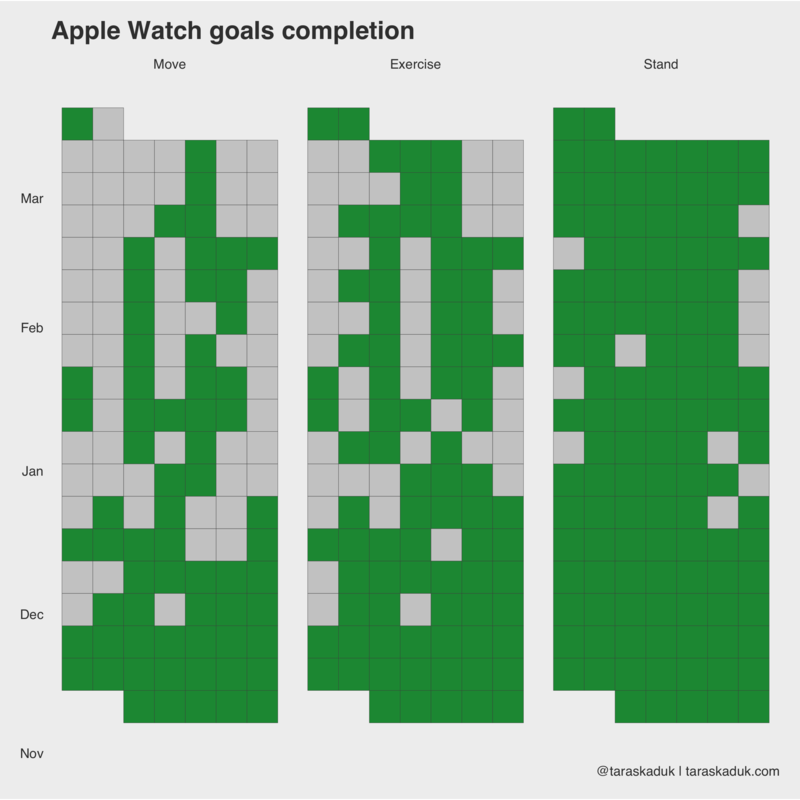 Same can be done with a “days X months” grid, or anything else - you name it. 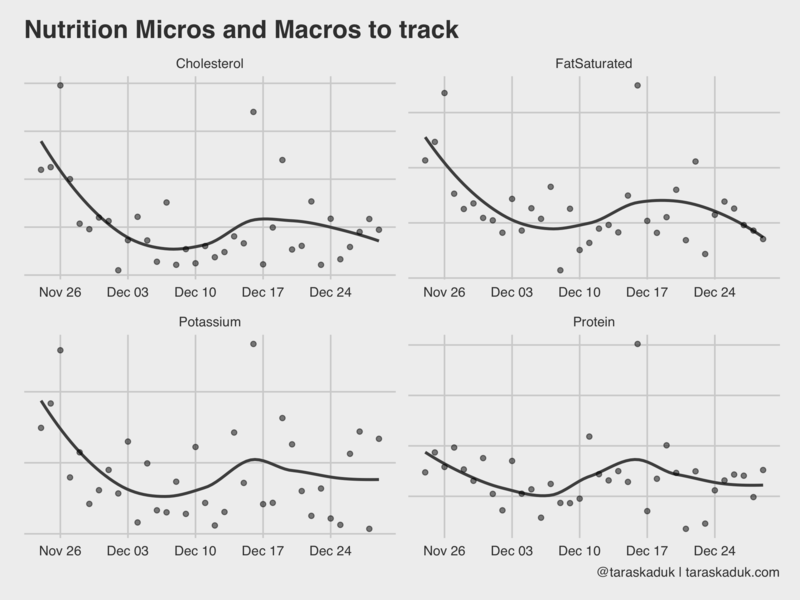 Speaking of nutrition data, you can track many various macros and micros directly from Apple Health if your nutrition tracking app is connected to it. For example, you could plot your protein intake against your body weight and then visualize the percentage, if you’re working out and need to ensure a specific amount of protein intake every day. 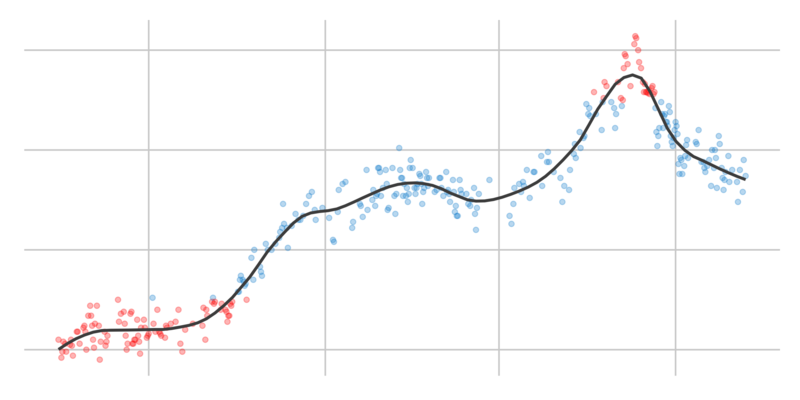 With a bit of data wrangling, you can do lots of cool stuff. I maxed out the acceptable amount of vanilla charts in this post, so let me do another tile chart again. This will require a bit of R code though, but stay with me here. #Now, create 2 new metrics: percent of goal and a "Yes/No" flag. I’ll gather my data 3 times for each metric (and won’t write a function, go tell @drob on me), and stitch it together to get a tall dataset. 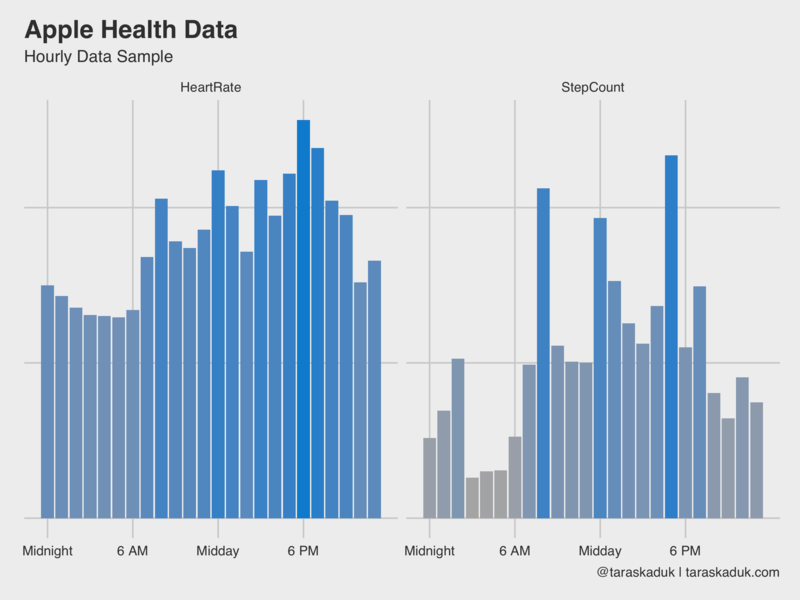 If you’re a health nut and an Mac-head like me and happen have an iPhone and an Apple Watch ⌚️ - chances are there is a lot of data sitting in your Health app. Whether you want to just play with it (as much as I hate this colloquialism - it is sometimes unavoidable), or use it with some purpose - it is really easy to dig into it. Hope this post will help you get statred, as well as provide some ideas for your own purposes. 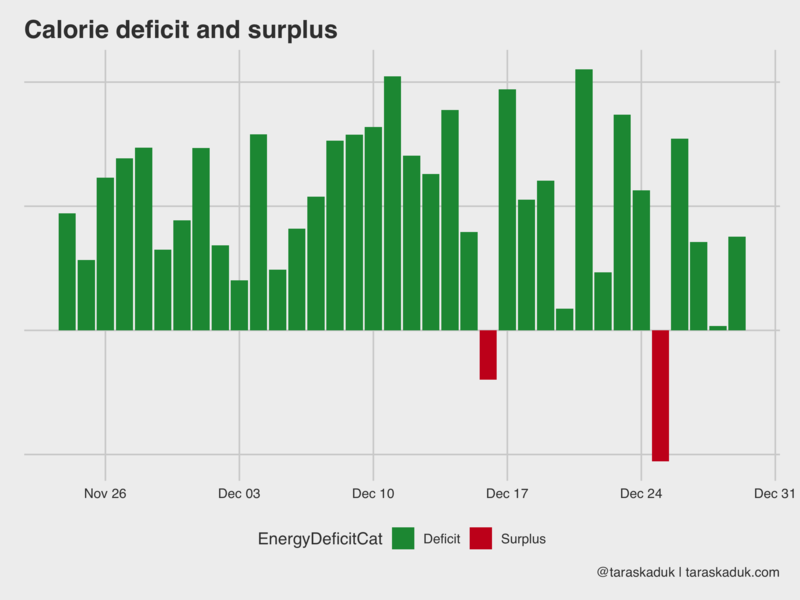 Feel free to share your charts, but don’t forget to hide sensitive data (erasing a y-axis is a start)!